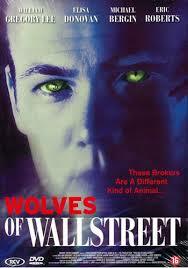 Today’s feature is David DeCoteau’s Wolves of Wall Street, about literal werewolf stock brokers. Wolves of Wall Street was written by Barry L. Levy, who also provided screenplays for the films Vantage Point, Paranoia, and a short film called How The Pimp Saved Christmas. Wolves of Wall Street was directed by David DeCoteau, an infamous b-movie director who has been behind such films as Puppet Master III, Dr. Alien, Prehysteria 3, The Killer Eye, Retro Puppet Master, and A Talking Cat?!? The cinematographer for the film was Horacio Marquinez, who shot movies like World’s Greatest Dad, Vacancy 2, StarStruck, and Dummy. The team of effects workers for Wolves of Wall Street included Luke DiTomasso (A Most Violent Year, Nurse Jackie), Tobi Britton (The Flamingo Kid), Brian Abbott (Captivity, Party Monster), Ildiko Juhasz (Return To Sleepaway Camp), and Leza Ann Rawlins (The Motel, Going Under). The team of producers for Wolves of Wall Street was made up of Paul Colichman (Murder Dot Com, Gods and Monsters), Roberta Friedman (A Good Night To Die, Alphabet City), Andreas Hess (Ice Spiders), Sylvia Hess (Nuclear Hurricane, An Accidental Christmas), Michael Mahoney (Castle Freak, Trancers 5), and Jeffrey Schenck (Malibu Shark Attack, Big Monster On Campus). The musical score for the film was provided by Harry Manfredini, who has provided music for such memorable horror films as Friday the 13th, Swamp Thing, House, Deepstar Six, Wishmaster, Jason X, and The Omega Code. The cast for the film included Eric Roberts (Miss Castaway, Inherent Vice, Doctor Who), Elisa Donovan (Clueless), Bradley Stryker (The Lizzie Borden Chronicles), John-Paul Lavoisier (One Life To Live), Jason-Shane Scott (Starship Troopers 2), Michael Bergin (Baywatch), William Gregory Lee (Justified), and Jeff Branson (The Young and The Restless). The story of Wolves of Wall Street follows a young, aspiring stock broker as he moves to New York and breaks into the world of Wall Street. 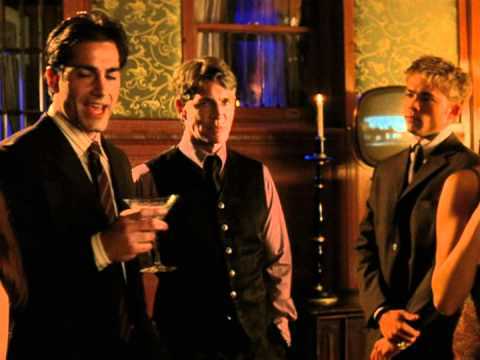 In order to make his way, he joins up with a ruthless firm of brokers, who demand his life in exchange for success. Also, they are apparently werewolves. 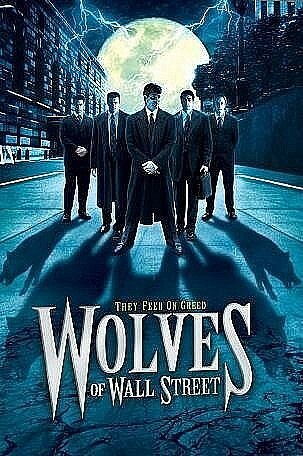 Wolves of Wall Street, as the title suggests, is (very) loosely based on the story of Jordan Belfourt, which would be made famous in Martin Scorsese’s lauded film The Wolf of Wall Street. Belfourt, on top of his notorious career on Wall Street, produced a number of b-movies (including Santa With Muscles) over the years, and became a friend of David DeCoteau’s from acting as a producer on his films Skeletons and Prey of the Jaguar. Wolves of Wall Street, shockingly, is not a very subtle movie. The parallels between wolves and stock brokers are made constantly and explicitly, to the point that is is exhausting to sit through. Stock brokers are shown urinating on objects to claim them, obsessing over red meat, showing off superhuman senses of smell, and pack hunting, and the full moon might just have more screen time than Eric Roberts by the end of the movie. Before I even got halfway through the movie, I was muttering to myself “yeah, I get it.” At the same time, the movie does everything it can to not show that the stock brokers are actual werewolves, which I have to assume was a budget decision. After all, special effects makeup is expensive, and I think this movie was made for less than the wardrobe costs of The Wolf of Wall Street. One of my biggest issues with Wolves of Wall Street is that the supposedly relatable and pure protagonist is a bit of an asshat from the beginning of the film. 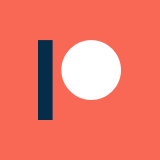 The central romance of the movie is the direct result of him essentially cornering a woman and refusing to accept that she didn’t want to date him, which eventually gets him what he wants. As the plot goes on, he becomes increasingly possessive and aggressively jealous. Basically, he is exactly the sort of jackass that the rest of the stock brokers are, but the audience is supposed to be on his side because he is theoretically good-hearted deep down. It doesn’t help that the actor playing him is absolutely terrible, but the writing of the character would have ruined him regardless. Worse than the bad characters, abysmal acting, and heavy-handed writing is the hard fact that this movie is just plain boring. In spite of all of those other problems, this might have made for a fun and cheesy film with the right spin on it. Unfortunately, this movie as it stands is the rough equivalent of watching paint dry, and I know what I’m talking about there. The only reason I might recommend watching this movie is for the interesting tangential connection to Jordan Belfourt and the much superior Scorcese movie, and because of how hilarious this movie would have been if it starred Leonardo DiCaprio as the Belfourt surrogate and Matthew McConaughey in Eric Roberts’s role. If only.